In an age of doubt, it's rare to find Christians who can speak clearly and boldly about the reasons for their faith. Douglas Jacoby is one of those rare Christians. As an international teacher for over 25 years, he has shared the vital truths found in "Compelling Evidence for God and the Bible" with thousands of people in all walks of life and in dozens of cultures. Jacoby's book is an easy-to-read apologetics work that will: show readers the evidence that there is a God; help readers see the unique role of the Bible as the Word of God; and encourage readers to make an informed decision about whether to follow Jesus. "Compelling Evidence for God and the Bible" is especially suited for nonbelievers, anyone new to the faith, and believers who want a better understanding of their faith and how to explain it to others. For readers who want solid reasons why the Christian faith is not only true but also reasonable, this book is the place to begin. Compelling Evidence For God And The Bibl by Douglas A. Jacoby was published by Harvest House in March 2010 and is our 34446th best seller. 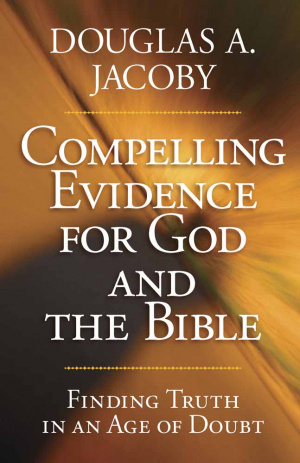 The ISBN for Compelling Evidence For God And The Bibl is 9780736927086. Be the first to review Compelling Evidence For God And The Bibl! Got a question? No problem! Just click here to ask us about Compelling Evidence For God And The Bibl.